Pioneer Technology Center’s partnership with Central Tech has brought Truck Driver Training to the Pioneer Tech district. Last month, six individuals graduated. 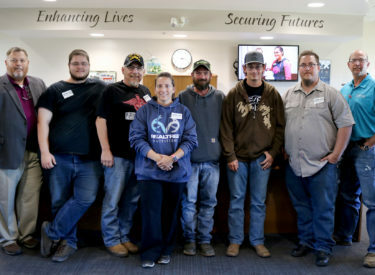 Pictured from left are Johnny Thornburgh, PTC Industrial Coordinator; Jason Alley, Newkirk; Mark Fine, Ponca City; Staci Jeffries, Ponca City; Justin Keenin, Ponca City; Cody Nibarger, Wakita; Jesse Quid, Ponca City and Ronnie Pennington, Central Tech instructor. For more information about this partnership or to enroll in one of these truck driving courses, contact Johnny Thornburgh at (580) 718-4222 or visit www.pioneertech.edu.